Provide comfort for the family of Julia Childress with a meaningful gesture of sympathy. Julia Childress, 93, of Toledo, Ohio passed away peacefully on March 1, 2019. Julia was born April 5, 1925 in Marigold, Mississippi to Isaiah and Luvenia (Noland) Slaughter. Julia moved to Ohio in 1940, where she worked at Toledo Hospital. She married Chester Childress in 1951, becoming a devoted wife and homemaker for 42 years. She enjoyed spending time with her children, grandchildren, and great-grandchildren. Julia also taught Sunday school and served on various committees for more than 64 years as a member of the Church of Christ until her health declined. Julia had a passion for cooking, shopping, walking, and collecting ceramic figurines. 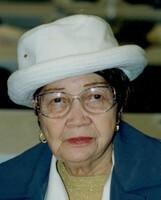 She was known to have an extensive collection of hats that she enjoyed wearing to church and on special occasions. Julia was known for her sense of humor, infectious smile, and her kind and compassionate spirit. She was a social butterfly who enjoyed being in the presence of family and friends. Julia was preceded in death by her husband, Chester (Sr.); son, Chester (Jr.); granddaughter, Charlotte; six brothers, two sisters, and parents. She is survived by her daughter, JoAnn (Robert) McCollough; brother, James Boyd; sisters, Lula (Lee) Brown, Doris (Rodney) Brown; grandchildren (2), great-grandchildren (10), great-great-grandchildren (5), and a host of cousins, nieces, nephews, and friends. The celebration of Julia’s life will be held on Saturday, March 9, 2019 at Glass City Church of Christ. Services will begin at Noon with family hour taking place at 11:00 am. To send flowers in memory of Julia Childress, please visit our Heartfelt Sympathies Store. Provide comfort for the family of Julia Childress by sending flowers. PEACEWITHGOD.NET Earth has no sorrows that Heaven cannot heal.